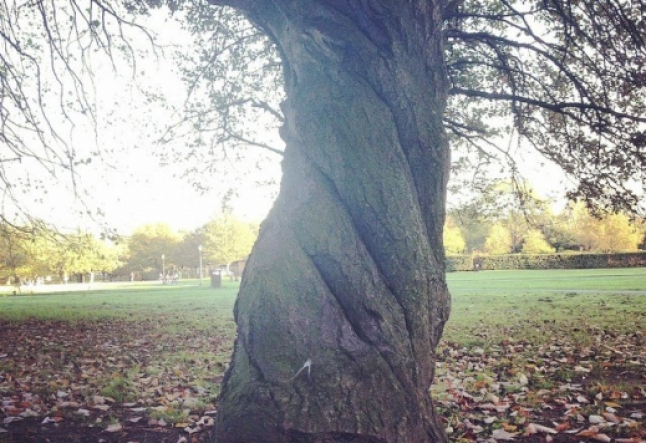 Rooted and Twisted… Isn’t Yoga everywhere? We say that trees are the lungs of the earth. House of thousands of beings, old wise spirits always gazing at the same landscape, quietly and calmly observing the time passing by. They breathe and give us breath. Static and malleable, they are nature’s children who play to grow taller and taller, defying gravity while surrendering to it by giving away its roots to the earth. There is a light yet invisible energy rising from the deepest root up to the softest leaf.Vṛkṣāsana is the name Yogis choose to imitate them. It is a great pose to reflect what equilibrium means: “a state in which opposing forces or influences are balanced." It's a state of rest or balance due to the equal action of opposing forces. Vṛkṣāsana, tree pose, an asana to build up gradually. Standing with both feet together, big toes are touching while there is a tiny space in between the ankles. Relax your toes by spreading them wide and allow the energy from the ground be the power and motor from which your pose will be built. There is a midline, centre of energy, which supports us to grow taller and root deeply. A subtle sensation of separation from between half upwards and half downwards. The need to fly and the need to stay grounded. Hence, midway we find balance. The standing leg becomes strong like an old trunk, yet there is still softness and lightness in its position; two qualities that allow us to receive nature’s energy beneath us. Direct your tailbone towards your heels. Inhale and shine your spine upwards as if hundreds of fireflies were running through it. Lengthen, grow taller… When reaching the crown of your head, exhale deeply and give the energy back to the air as a lending from the Nature. Gently place your palms together close to your sternum. Only your thumbs should contact your chest. Face your fingertips upwards towards the sky and find your Namaste hands. Visualize an imaginary thread from your palms downward, parallel to the also invisible centre line of gravity. Shift your weight to the leg you want to be your support in this balance pose and activate the sole of the foot. Energise the whole leg. Only below or above the knee joint will be placed the other foot and as you adjust yourself to this new body shape, breath in and out of your nose in coordination with the movement. Keeping your neck long and your shoulders released down like loose leaves. Rotate your right knee to the outside like a stylish branch coming out from the trunk, while keeping your pelvis and torso facing the front of your landscape. If you find yourself losing your balance or falling, avoid repetitive frustrated sighs. See it as a breeze which challenges you through this new process. Drop the negative thoughts of failing. 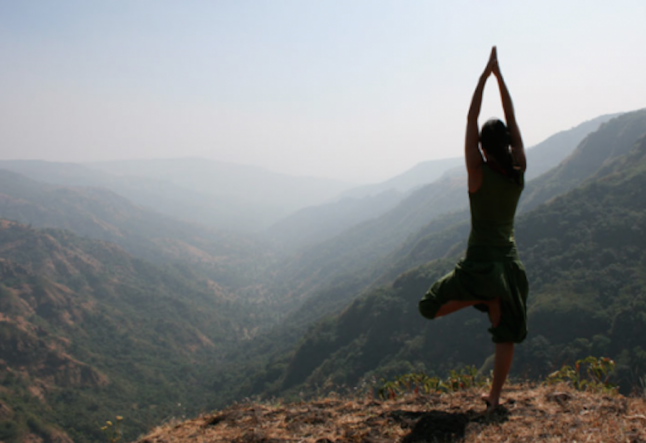 Trees gaze always forward… as we do in Vṛkṣāsana, tree pose. If you give time to your feet and leg muscles to re-adjust and re-learn a new way of standing, naturally, it will eventually bring you an easy peaceful equilibrium. The alignment of our feet is what causes us to stand with ease and equilibrium. Pada Bandha draws the energy from the earth, up the centre of the foot. That is our basic centre of balance. Three arches make the sole of the foot the perfect body support, our base. In Vṛkṣāsana, when shifting the weight into the standing leg, the medial longitudinal arch, been the closest to the midline is the one receiving more attention to this new weight distribution. By rooting through the big toe joint, we receive this extra energy needed to lift up. The big and little toes start working together as stopping points in between moving excessively to the east or to the west (right & left). A soft pendulum movement from the toes to the heel, stop us from going beyond North or South (forward & back). We might not remember, but we have all seen how difficult it is to learn how to stand on two feet. Vṛkṣāsana challenges you to stand only on one foot as a new mental and physical learning process. We re-master how to stand tall without one support. The loss of a support, generates the reluctance to start again from fear of falling. Wobbly beginnings are needed in order to develop strong foundations. …The process of the tree pose. How I apply this sentence to my Vṛkṣāsana practice? The immaturity of a Yoga practice can make us narcissist when trying to achieve what we think it is a perfect balance, a perfect pose. Like most things in life, it all comes with practice and with practice comes connection. That connection or unity needs to be nourished with challenges in order to make us mature. For most people, standing balances are very challenging and defiant poses. Most of the time, before achieving balance, we drive through unsteady periods where we find ourselves falling uncontrollably. In Vṛkṣāsana, the equilibrium is found when loss of the comfort zone is accepted and it is softly and gracefully interiorized. Feeling rooted in the midst of uncertainty. Walking barefoot on someone else’s “feet”, asking how long it took him to stand tall and strong despite all the scars seen in his skin. Twisted, lengthened and rooted, I seem to find the meaning of Yoga everywhere in nature.We copy them and by copying, we become. Beautiful old beings, may we all become you at the end of the journey.